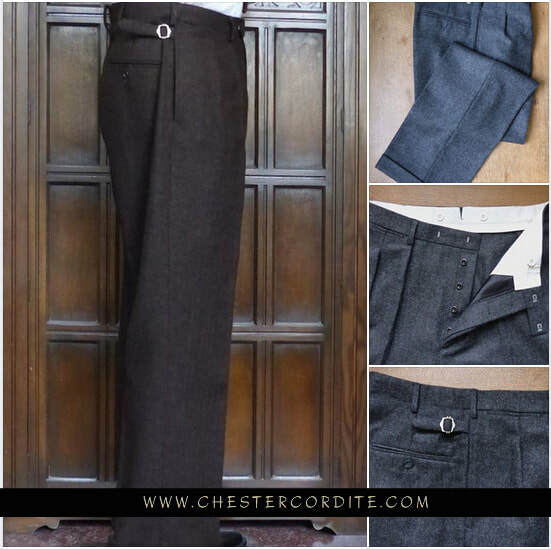 Welcome to Chester Cordite - Modern Vintage Menswear. 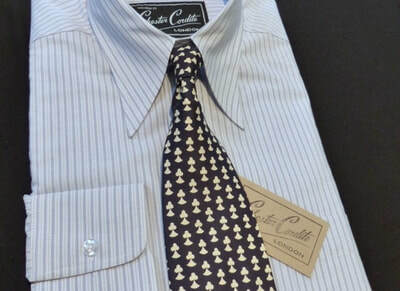 at splendidly affordable prices and all suits made in England. 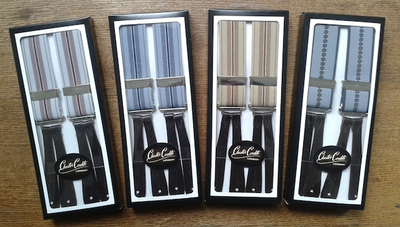 it can be difficult finding that’ just right’ style in your size and colour. with our beautiful quality vintage reproduction garments. 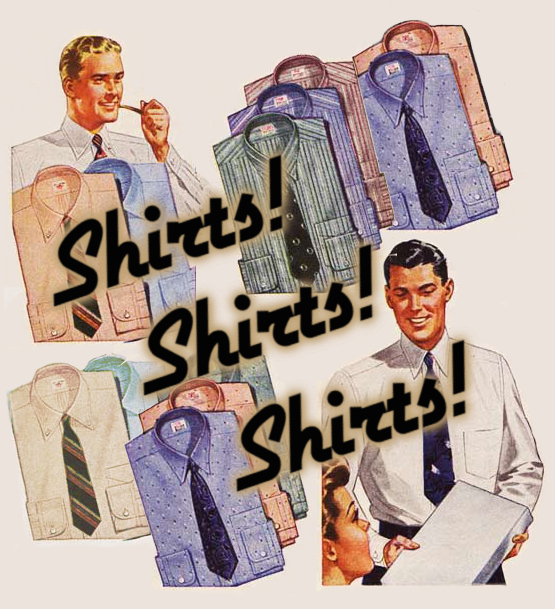 try suits & shirts for fit at the Muswell Hill, North London studio. Our modern vintage chestnut tweed herringbone suit, inspired by the golden age of the 1930s and 1940s. Peak lapel 3 piece suit with patch pockets & 6mm swelled edges. High waisted trousers with plenty of details. Plain back jacket. 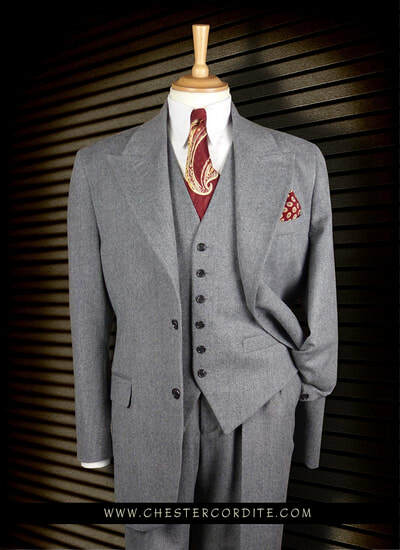 Our modern vintage brownstone herringbone double breasted suit, inspired by the golden age of the 1930s and 1940s. 2 piece suit with high waisted trousers. Our modern vintage flint stone blue tweed herringbone suit, inspired by the golden age of the 1930s and 1940s. Our modern vintage flagstone herringbone double breasted suit, inspired by the golden age of the 1930s and 1940s. Our modern vintage dark brown herringbone tweed suit, inspired by the golden age of the 1930s and 1940s. Peak lapel 3 piece suit with high waisted trousers. ORDER NOW our modern vintage double breasted chestnut suit with action back, inspired by the golden age of the 1930s and 1940s. 2 piece DB suit with high waisted trousers. Our modern vintage taupe pin-bone double breasted suit, inspired by the golden age of the 1930s and 1940s. Peak lapel 2 piece suit with high waisted trousers. inspired by the golden age of the 1930s and 1940s. 3 piece suit with high waisted trousers. Peak lapel 3 piece belt back suit with high waisted trousers. Our modern vintage brown herringbone double breasted suit, inspired by the golden age of the 1930s and 1940s.